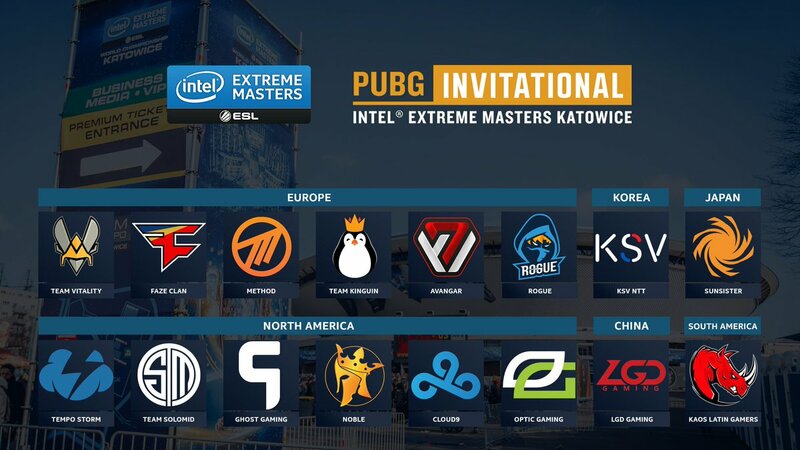 Nine teams were invited to the IEM Katowice PUBG Invitational, with another seven teams determined through closed and open qualifiers. Notable mentions include IEM Oakland winners Team Vitality, runner-ups Tempo Storm and Ghost Gaming, the ever-successful TSM, Cloud 9 Noble, Rogue, Kinguin, FaZe Clan and Optic Gaming. Alongside them are the revered CIS team Avangar, with international teams such as SunSisters hailing from Japan, KSV from South Korea, KLG from Latin America and LGD from China. Each of these teams brought a 4-man roster to Erangel to compete for points over two four-round days of PUBG. Many of these teams were not present at IEM Oakland and have been travelling to Asian events where they compete primarily in third person, as opposed to the first-person gameplay used at IEM Katowice. The format of competitive PUBG has teams fighting for both placement and kills - a win is worth 400 points (second place is worth 300, third is worth 240 all the way down to 16th being worth a mere 23 points - click here to see the full breakdown) and each kill is worth ten points. This means dying early on in the loot phase can be absolutely crippling throughout the rest of the tournament, and the results of prior matches affect strategies and decisions as the matches progress. The show kicked off with Kaelaris, Toffees and Avnqr at the desk explaining some of the default strategies these teams have developed over the last few months competing against one another online. In an effort to avoid early-game conflict and find enough loot to comfortably transition to the mid-game, teams tend to favor one or two specific spots on the map - FaZe like to take Mylta, Avangar prefer North Georgopol, TSM default to Yasnaya, and so on. Kicking off the tournament, PlayerUnknown gave the players an extremely challenging circle: Centered over Novorepnoye on the eastern side of the military island, with approximately 70% of it being in the water. With only Faze, Vitality, KLG, Noble and Rogue being in the circle at the start of the match, eleven teams must move from as far as Zharki to get into the first circle. Notably, Rozhok, school and apartments are left untouched and most teams have clustered along the western side of Erangel. With many teams forced to fight a literal uphill battle, the top 3 heavily favors Optic as they’ve managed to keep all four members alive against Method and KSV. Optic cleans up Method shortly after their previous engagement with Rogue, leaving the final 2 teams down to a 4v2 in favor of Optic as they secure the first dinner with a wide concave against a weakened KSV, taking first place on the leaderboard with 480 points. And @OpTicGaming takes the chicken dinner in Game 1! Game 2 has the circle center on the north-western part of the map, favoring Avangar and Optic in North Georgopol. With teams not needing to contest the bridges and water to make it to the military island, all sixteen teams are still alive after the first 15 minutes, securing viable loadouts and positions to transition into the mid game and at most losing only one or two members. KSV encounters Tempo Storm holding a house outside of Georgopol with some of the first grenade kills of the tournament! Meanwhile, Avangar’s excellent aggressive repositioning throughout the game in their home territory north of Georgopol carries them all the way to the final 2, where they keep all four members alive against a defending Method who are trapped inside the western bunker at the Shooting Range. What a game from Avangar! Here is where the high-risk/high-reward comes into play. Avangar’s strategy of landing North Georgopol, aggressively pushing the best position in each circle and dominating all the fights they take paid off, bringing them from last place to second in a single round. Taking advantage of the angles and dangerous positioning from Method, Avangar close out game 2 with an impressive 17 kills between the four of them, bringing them to a total of 603 points. However, after going out in 16th place in game 1 they tail behind Method on the leaderboards with 700 points, thanks to two consecutive top 3 finishes and 16 kills across the two rounds. Game 1 winners Optic hold in third place. The plane and circle have players returning to the Sosnovka Military Base, but this time the circle is a bit more centered over the island with less of the 3.7km radius being taken up by water. Once again, all teams are still in the game for the first 15 minutes, getting looted and taking positions. The beginning of the mid-game usually signals a lot of combat, as the circle begins closing to ranges where most teams can see or hear one another. On the west side of the circle, Kinguin and Rogue run into one another, drawing the attention of Tempo Storm who must now defend. Fights continue break out throughout the entire map as one team battles another and more teams move in to interfere. TSM’s positioning does not pay off as they get caught coming down the mountain by Noble and Cloud9. Optic, Kinguin, Noble and TSM are all on the south side of the circle and gradually encounter and die to one another due to the vertical terrain limiting their cover options, with Cloud 9 overlooking from one of two remaining compounds picking off the stragglers and racking up kill points. Within five minutes, it’s down to the top 3 between Cloud 9, Vitality and the sole surviver from KLG, Papaya. Cloud9 hold a compound as the circle centers on them, forcing Vitality to come to them. Vitality, showing why they won IEM Oakland, moves brilliantly using smokes to cover the most dangerous angles and surrounds the compound Cloud9 holds, taking out Moody who is holding a tower by himself with his other two teammates in the adjacent buildings. C9's Frexs attempts to rotate to revive Moody but gets caught by the firing line of Vitality, who also spot Papaya on the way. IEM Oakland champions Vitality close out game 3 in a 4v1v1, having only one of their members knocked out (and revived) by tactically eliminating all of the advantages Cloud9 had in their compound and using the buddy system to ensure a lurking Papaya can’t hold them back. The final game of day 1 opens with one of the most accessible plane paths we’ve seen yet, travelling west to east right down the center of the continent. With functionally the entire map up for grabs, almost all teams move to their default locations - but FaZe gives up Mylta and Mylta Power and instead heads to Lipovka and the surrounding areas, with Kinguin taking advantage of Rozhok, school and apartments being up for grabs. No teams attempt to loot the military island, as the first circle positions itself around the southeastern corner of Erangel. TSM’s protocol thus far has to been to rotate to a central location early on, defend it and only move when necessary. With the circle heavily favoring LGD, they hold the Mylta factory building throughout the match as the circle continues to shrink on that compound throughout the game. The game progresses to a highly tactical contest of angles, reflexes and positioning as circle after circle teams are forced to move through the open terrain surrounding the Mylta factory compound and hold cover along the walls. LGD holds the building as a deathmatch ensues outside, racking up safe kills whenever possible with their high ground advantage, while TSM fights their way through and secures a position downstairs below them. Meanwhile, Optic holds outside as the three teams begin the first final-circle standoff at the PUBG Invitational at IEM Katowice. As the final circle forces LGD off the top of the balcony, TSM out from the building and Optic out from behind the shipping containers, Optic eliminates TSM and quickly turns to fight LGD’s Simsn above. The final circles in PUBG involve a critical decision: Do I fight, or do I heal - and try to time my medkit procs to outlast my opponents as they fry in the blue zone? In the end it was Optic who’s decision to aggressively push the two remaining teams that secured them the win. LGD elected to send one player out to fight and keep one back to heal, taking out Optic’s 7teen but losing Simsn to hypoc. As the final player from LGD didn’t move, the circle began damaging him before any of the Optic players, resulting in an early death from play zone damage, giving the win to Optic and giving them their second chicken dinner of the day. By the end of day 1, Optic leads with 1240 points, followed by Vitality and Avangar with 992 and 933 points respectively. The transition between day one and two can be very significant - teams have the opportunity to go back and review the matches from that day and make changes in their strategy, and their overall objectives have to change depending on their position on the leaderboard. Teams on top have the ability to play a safer style overall, whereas teams farther down will have to both win rounds and pad their scores with as many kills as possible to close the gap - especially as we get closer to the final rounds. Game 5’s circle begins centered over Gatka and the western side of Erangel. Early on, Optic encounters FaZe as they rotate into the circle as FaZe successfully keeps them outside of the circle, sending the day 1 winners back to the lobby at 12th place. You can't heal against this bullet barrage! TSM holds a central compound as teams carefully navigate the open terrain of the Gatka farm fields, using vehicles for cover and selectively taking fights. The final circle is positioned on the northwestern side of the play zone, forcing all players out into the open. TSM moves out from their compound and encounters Ghost Gaming on one side and FaZe on another, as Ghost cleans up shop and earns their first chicken dinner of the tournament. In a post-game interview, Ghost Gaming's DefineLegit explained that their success was driven by a massive shift in strategy from day 1 - originally the in-game leader role was split between DefineLegit and Prophie, which they identified as a major point of contention after the previous day’s matches. He attributed handing the reins over to Prophie completely as the defining factor of their victory, highlighting just how much a team can improve overnight. The sixth round of the PUBG invitational has players battling around Severny. Game 6 winners Ghost Gaming head to Kameshki to loot, but then suffer a catastrophic rotation back into the game as Noble attacks them along the northern coast of Severny. Noble knocks out three members of Ghost Gaming as they hide along the rocks, but an aggressive push forces the survivors into the water where Mccoy gets caught and only Austin survives. Austin later gets caught in the crossfire of a 3-way fight between FaZe, Avangar and KSV, putting game 5 winners Ghost Gaming out at 16th place. As the circle moves around the Shooting Range, Avangar continue to move aggressively with the majority of the remaining teams holding the southern hills overlooking the Shooting Range, but are eventually forced downhill. The rotation is an absolute massacre as Avangar hold the defilades outside of the shooting range and manage to post up 9 kills. Avangar and Tempo Storm are the only two teams with full rosters at this point, with SST in the cabin, and LGD and Noble each with 2 players lurking inside the shooting range. Avangar and Tempo storm trade knockouts but can’t secure any kills and as Tempo Storm looks for a better position they get spotted by Noble_boom inside the shooting range, triggering a push from Avangar. Noble gets eliminated, while SunSisters’ Wesker and Frachan wait on the north side of the shooting range for the perfect opportunity to strike as LGD’s Simba attempts a solo flank on Avangar, who defend successfully and finish LGD. With the final circle approaching, Avangar and Tempo Storm trade knockouts and SunSisters look to flank, but our second standoff of the tournament ensues as all 3 teams choose to hold their angles. As the final circle closes, SST and Tempo Storm engage one another, SST loses the fight but severely damages Tempo Storm, who get finished by the play zone, leaving Avangar with their second win of the tournament and 16 kills - all without firing a single bullet in the final standoff. Now that Avangar leads with two chicken dinners and 510 points from kills overall, teams must look to score significant kill points to bridge the gap. Game 7 begins with a circle over Yasnaya, where TSM has been defaulting to. The beginning of the match is action-packed with 6 kills before the first circle shinks. The second circle forces teams out of Yasnaya and the surrounding areas and into the Northern hills below Stalber as TSM opts to quickly rotate to the northern village, but runs into Noble and Ghost and unfortunately goes out in 16th place. Going out early in these final rounds lowers the ceiling for your potential final standing. Optic eliminates Ghost Gaming and Rogue eliminates Vitality, severely damaging those teams’ chances to be in the money on the leaderboard going into game 8. Method continues to aggressively push the center of the circle as Avangar runs into Optic and a fight breaks out between the #1 and #2 teams. After trading members, Avangar is able to fully revive their team and eliminates Optic at 10th place, allowing them to cement their lead over the #2 contenders. Noble moves on Avangar later on and suffers heavy losses but is able to eliminate Avangar at 8th, opening up the opportunity for many of the other top 8 teams to work their way into a top position. The final member of Noble is ultimately kept out of the circle, as Cloud9 find Method and barely manage to take them out, with three of their players knocked out but successfully revived shortly after. The final battle is down to Cloud9 holding the high ground and Rogue below, but the pressure is on Cloud9 as the circle is pushing them off their cliff and into the open. Despite Cloud9’s first win of the tournament, it only brings them up to fourth place in the standigns going into the final game, nearly tying with Noble with only a single point between them. Avangar lead with an impressive 1933 points, followed by Optic at 1521. Avangar is sitting pretty on the top spot right before the last match of the @PUBATTLEGROUNDS Invitational! 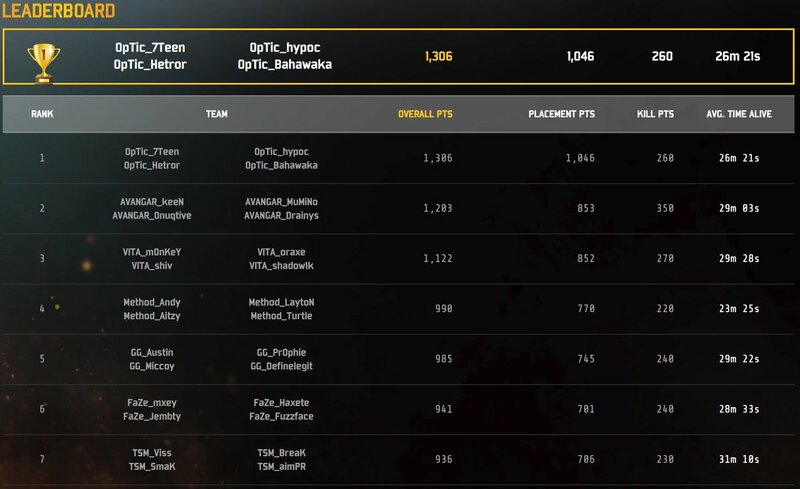 The leaderboard going into the final game lays out the objectives for all the teams: For teams like Optic, they need to out-pace Avangar by over 400 points, requiring either Avangar to go out at 16th place and getting their third chicken dinner of the tournament, or placing high and getting enough kills to make up the difference. The circle favors Avangar and Optic once again at North Georgopol, but they elect not to fight one another as LGD lurks in between. As Avangar rotates out of Georgopol, two of their players get caught and killed by KSV. Avangar is later forced to run the gauntlet through Optic, Rogue and Method and ultimately dies in 16th place (with over 20 players dead from other teams already!). Optic takes notice and goes into rampage mode in order to make up the approximately 400 points they will need to win the tournament. As Optic look to take as many engagements as possible, they take out Tempo Storm and then attacks KSV. As Ghost Gaming and Cloud 9 move to take positions against Optic, FaZe starts taking out players from both teams, enabling Optic to move in and wipe out Cloud 9. Ghost Gaming is down to just Prophie, FaZe have all four members alive and Optic is down to three players. Optic ultimately goes down to FaZe’s superior numbers, followed by Prophie just a few seconds after, putting Optic down to third place, Ghost Gaming at second and FaZe winning the final round. Depsite posting an impressive 12 kills, Optic Gaming fell just shy of Avangar’s stellar performance by 75 points. Check out what the IEM Katowice PUBG Invitational winners Avangar had to say after the tournament! Congratulations to Avangar, we’ll see you next time!